On the one hand, it is closest to breaking the channel since it has been in November to the downside. This would obviously be bearish, especially if support at the prior low of 1278 is taken out. Momentum indicators such as the RSI and both MACDs have already turned downward. Alternatively, a bounce off support would provide the opportunity for the negatively divergent higher high I am looking for between the recent high of 1300 and the 76.4% Fib at 1318, or possibly even the 85.4% Fib at ~1330. I am leaning towards the latter, given developments in USD/CNH (offshore USD/CNY) and XAU/CNY (Gold in yuan terms). Last week, I outlined the various reasons why a negatively divergent higher high was a high risk. 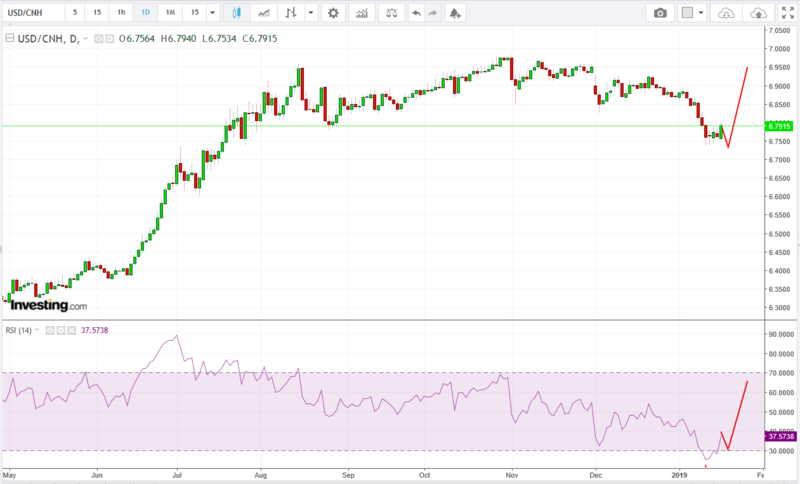 Among them was the risk of a positively divergent lower low in USD/CNH that could trigger a rally. 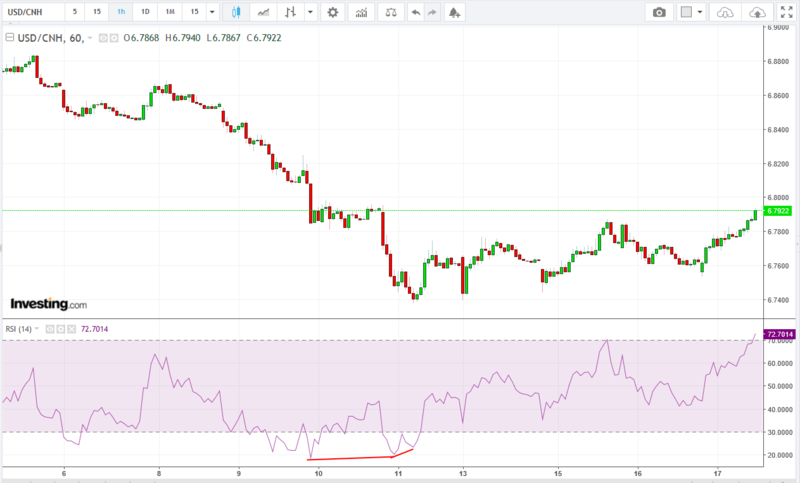 At the same time, the XAU/CNY displayed a near-perfect setup for a negatively divergent higher high from which it would fall. 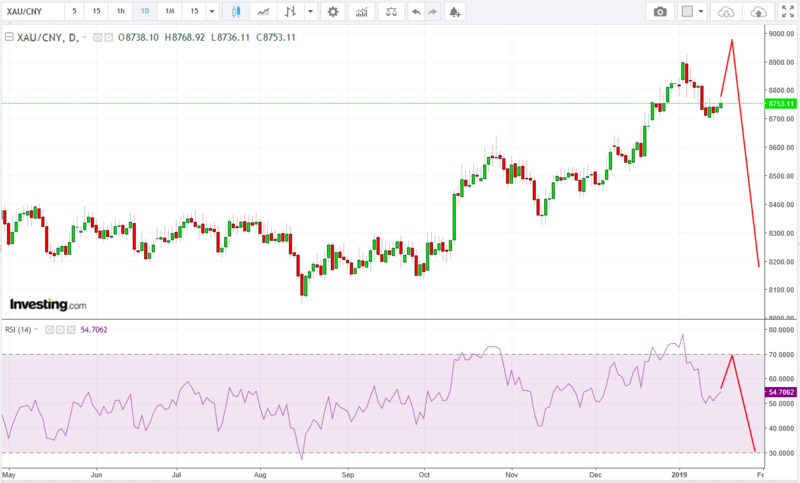 The combination of the two would mean Gold going up to a higher high above 1300 but then falling back to support between 1260-70 or perhaps much lower. Suffice to say that developments over the past week continue to support this hypothesis. USD/CNH rebounded as expected from its positively divergent lower lows on an hourly basis. It is now overbought and ready to reverse. This creates the opportunity for a positively divergent lower low on the daily chart. 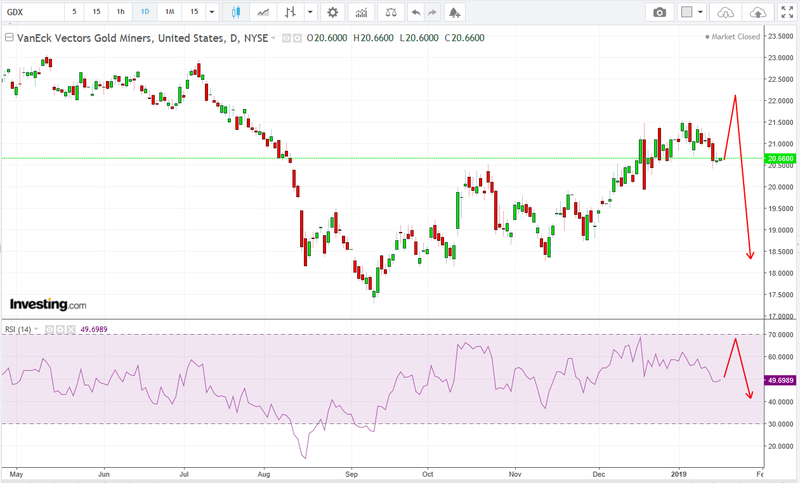 At the same time, following the extreme overbought situation on the daily chart for XAU/CNY, the exchange rate has fallen and the overbought condition has been corrected. 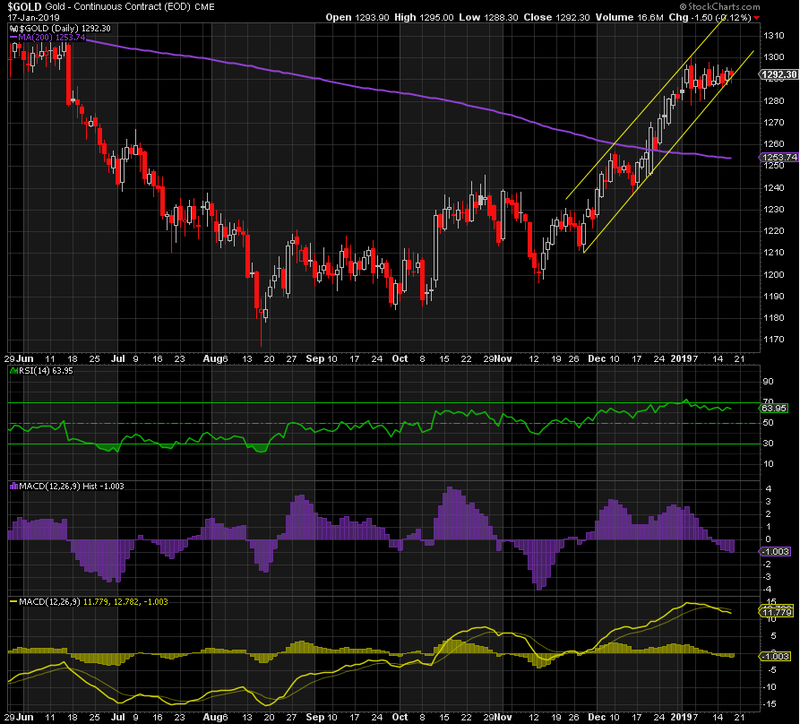 In fact, the RSI is now turning up again as expected. Now we’re ready to move up to a negatively divergent higher high. If both of these scenarios play out—a lower low in USD/CNH and a higher high in XAU/CNY, followed by a reversal in both—then Gold is going up to a higher high in dollar terms before falling. The only question at that point will be: how low do we go? The same scenario is also playing out in Silver. 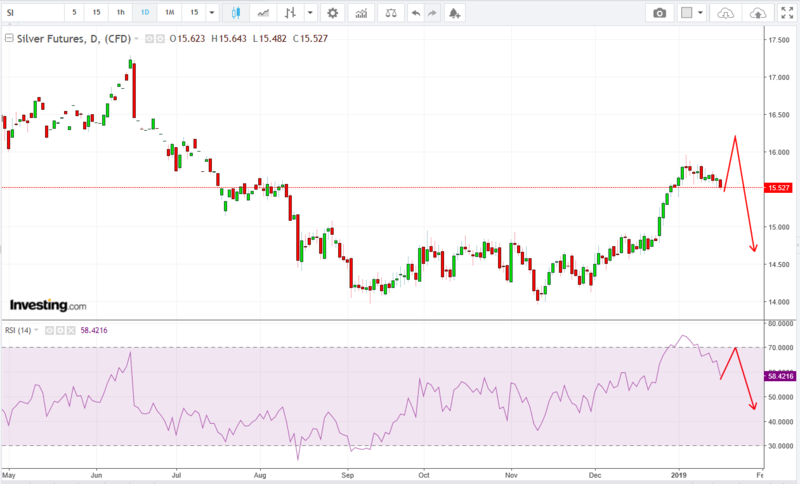 The daily chart illustrates the perfect setup for a negatively divergent higher high, should Silver choose to take it. Even the miners, represented by GDX, are showing this potential also. For those of you who need a catalyst for a move in Gold, Silver, and GDX, a short-term reversal in the S&P back down to the 2400s could precipitate a move higher in precious metals, based on the premise that it reduces the risk of further rate hikes and increases the probability of a Fed policy reversal to rate cuts and “QE” again. However, if this is followed by a rally to 2800 or higher, which is my primary scenario for the S&P prior to the third and final leg of this crash to 21/2200 or lower, precious metals and miners would likely fall hard, as those expectations for rate hikes increase and those for a Fed policy reversal recede. I don’t believe the stock market has bottomed yet, nor do I believe we will see the low until the Fed “actually” reverses policy. Currently, they are pretending to be dovish in order to boost stocks to enable further rate hikes. They are “Hawks disguised as Doves”. The Fed needs a higher S&P to justify further rate hikes, and that is what it is pursuing now. 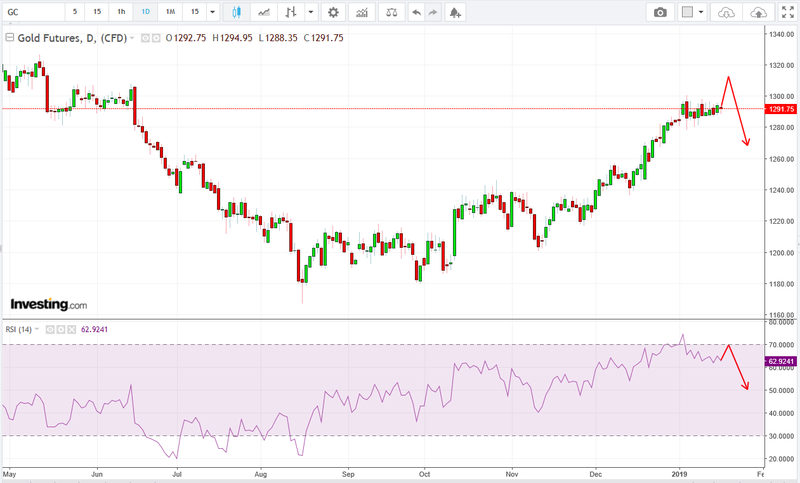 As outlined above, this will likely be negative for Gold in the short term. Back on September 14, I wrote an article titled “When the U.S. Stock Market Crashes, Buy Gold”. In my opinion, the final Act of this stock market crash has yet to play out, and when it does, the Fed will reverse policy. This will signal THE LOW in Gold, Silver, and the Miners, and all will soar from there, in my opinion. At the risk of stating the obvious, and in order to be crystal clear, if we do get a sizeable pullback in Gold, Silver, and the Miners—and I expect we will for all of the reasons mentioned—this is your best opportunity to BTFD, because we will likely never see such levels again.